In the realm of Vietnam’s musical instruments, the gongs are very well-known for their outstanding value and regarded as the privileged language bridging humanity and the supernatural world. The gongs are made fr0m a mixture of bronze and silver, with some distinctive features. The peoples living in the Central Highlands of Viet Nam possess many sets of gongs, which would be performed differently. A set of gongs consists of two to twenty units. 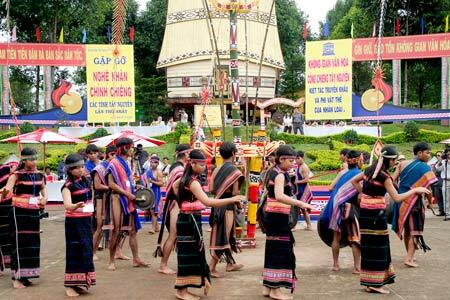 The Central Highlands gong comes fr0m long-standing historical and cultural traditions. In the past, community of people in the Central Highlands knew how to play the gong. Its sound is either deep or strong, moving and combining with the sounds of streams, wind and the hearts of people so that it can live with the heaven, the earth and people in the Central Highlands. It is a bright sunny day and a group of seven men are outside playing brown tambourines. Only five of the seven men are clearly visible. Their bodies describe a semi-circle facing the left of the picture. They all wear calm expressions. Each man holds the tambourine in his right hand, hitting it with a short thick piece of wood held in the left. The tambourines all have white ch@racters written on them. All the men are wearing the same costume: a dark-blue long-sleeved shirt with multicoloured cuffs and a red square piece of material with golden buttons down the front. Some of the men wear caps; the first man fr0m left to right wears a yellow cap, the second fr0m right wears a blue cap. In the background we can see a forest with blue sky just visible through the dense foiliage of the trees. Smoke is spiralling upwards fr0m the dirt floor. On the far left of the frame we can see the entrance to a hut.